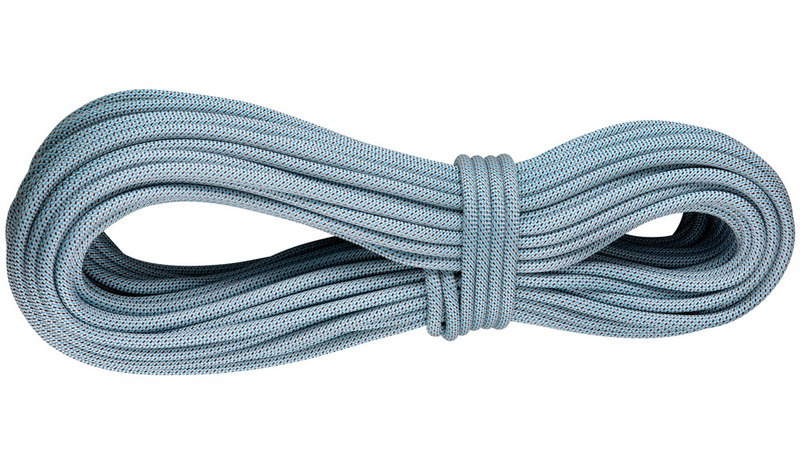 Black Diamond released its rope line in January, offering a total of 13 new cords. At 2.1 ounces per meter, the 9.2mm Full Dry is the lightest of the single ropes, designed for use in any season. 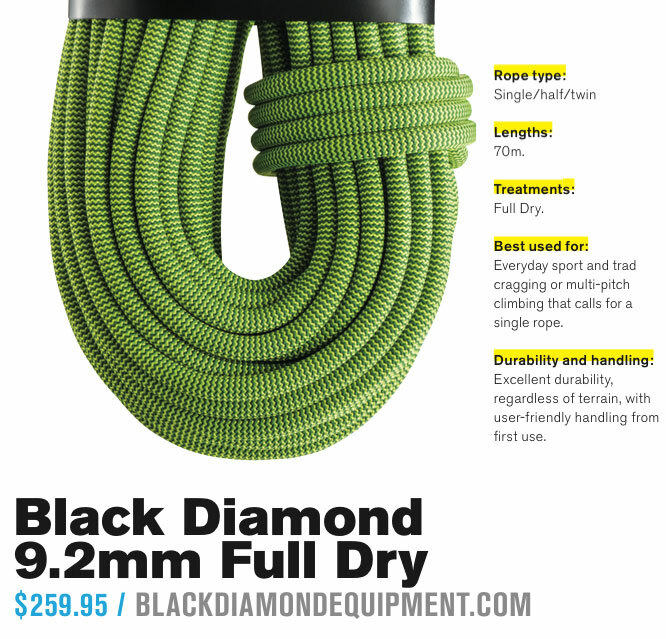 Black Diamond released its rope line in January, offering a total of 13 new cords, from beefy 9.9mm gym ropes to a 7.8mm half rope. At 2.1 ounces per meter, the 9.2mm Full Dry is the lightest of the single ropes, designed for use in any season. The selling point of the 9.2 is its durability. My partner and I gave this rope hell on over 100 pitches of climbing: single-pitch limestone sport routes at Shelf Road, offwidth thrutch fests in Indian Creek, giant multi-pitch walls in Zion, and the sharp granite of the Black Canyon. The rope, despite use on tough terrain—including me repeatedly grinding it into the rock while desperately trying to wedge my feet into sandstone splitters—proved durable indeed, with only minor aesthetic fraying occurring after 70 or so pitches. The only considerable flaw in the rope’s resilience was that the middle marker faded quickly to become almost indistinguishable after only 30 or so pitches, leading to mild frustration when rapping a multi-pitch climb. The downside of this durability is a little extra weight compared to similar ropes on the market. The 9.2 Full Dry weighs up to 10 ounces more than other 9.2mm 70-meter ropes, but unless you’re waxing your legs to achieve optimum sending weight, that shouldn’t be a problem. This rope is also certified as a half or double rope, although two of these guys used together would be weighty for that application. 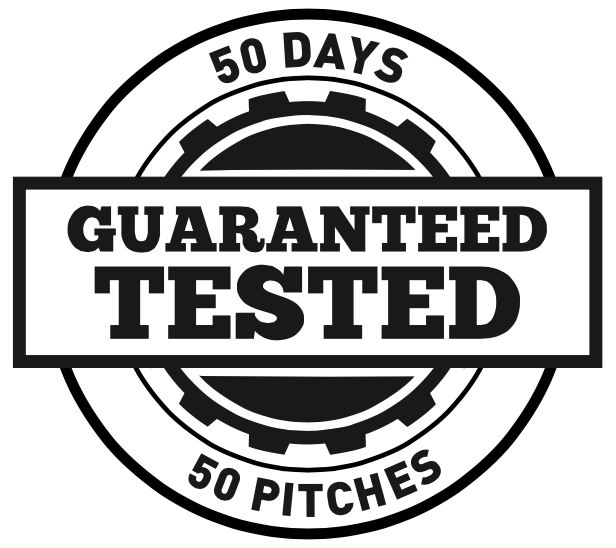 Straight out of the box, the rope was malleable and obedient, and it continued to behave, with no twisting or intolerable knotting throughout the 100-pitch test period. Its suppleness helped produce trustworthy knots that sat snugly, without the stiffness and loosening often accompanying new ropes. The only downside to this tightness was encountered when adjusting hitches at belays, which could be a little tricky, but I’ll take a secure hitch over a loose one any day. Flowing through both a GRIGRI and an ATC guide plate, the rope handled well and was easy to control when belaying and lowering—often a disconcerting task when using a thin new rope. 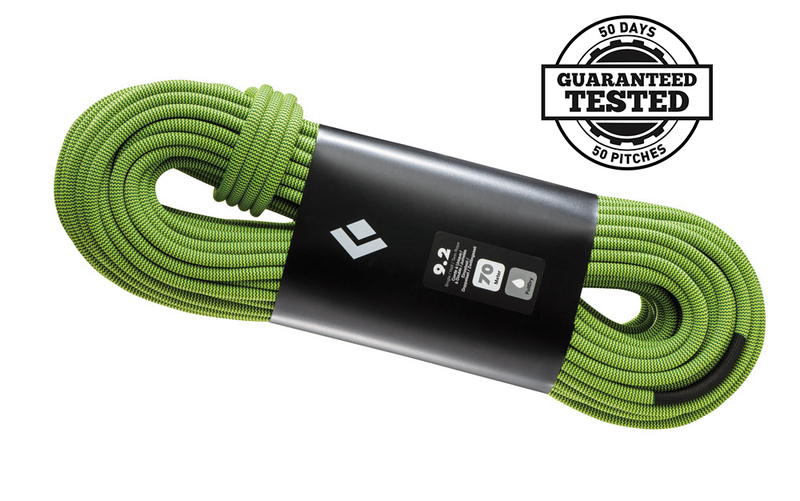 In addition, it gives a nice, reassuring catch using both devices, with less stretch than a performance sport rope. 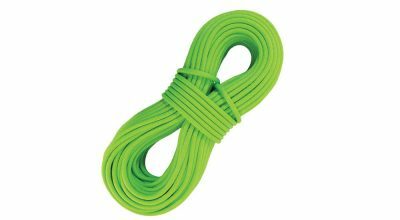 In short, this rope has a lot of the characteristics of a chunkier cord, making it a solid choice for everyone from sport climbers to wandering Jack of All Trades. This article appeared in Rock and Ice issue 243 (July 2017).